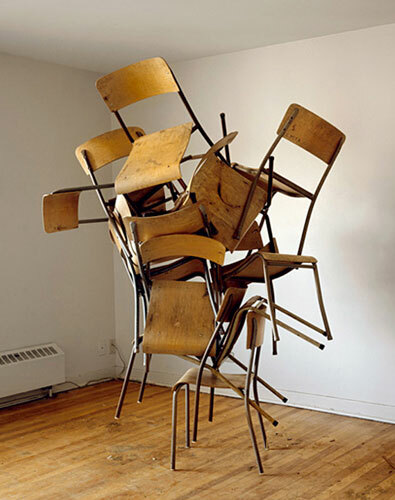 I love modern childrens’ furniture. Its a trend in juvenile products that has caught on like wildfire. But the funny thing is, most of the popular modern pieces are reissued mid-century designs. Something fabulous and unforgettable was happening in the 50’s. My second child Hudson is my modern child, I happily splurge on designer furniture for him that is a fraction of the size and cost as the originals. My inner child lives vicariously on those indulgences without sacrificing my adult decor style. 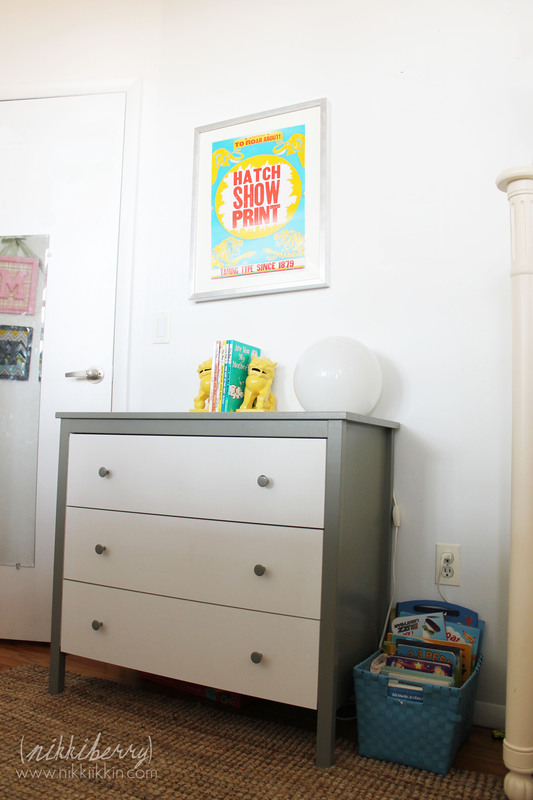 I’ve already featured my son’s bedrooms as he progress from Nursery to Toddler, and along with a toddler comes (lots of) toys and play spaces. Here is how I live happily with ours. While his bed and dresser are in the bedroom, Hudson’s toy box, table and chairs are in the living room. He drags all the toys out there anyway so I decided not to squeeze them into the shared bedroom. There’s a funny little family story about how I’ve been on the hunt for a coffee table for a few years. With transitions in our life, moves and changes in spaces, I finally thought I was ready to pick something. Then Hudson needed a play table and pouf! I gained a “coffee table”, at least is looks good in my living room! Hudson’s play area may intrude on our living room space, but I’m happy with the modern childrens’ furniture that I get to add to my collection. 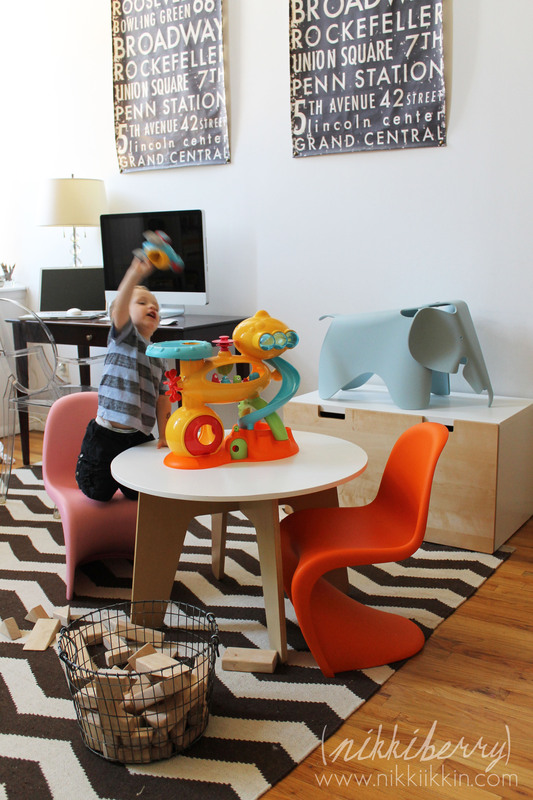 Like little works of art, the Eames Elephant and Panton Junior chairs are not just pleasing on my eye, their colorful, sculptural and nearly indestructible construction are perfect for my son’s rambunctious pretend play. And like all of our polypropylene furniture, they clean up like brand new with a Mr Clean Magic Eraser. 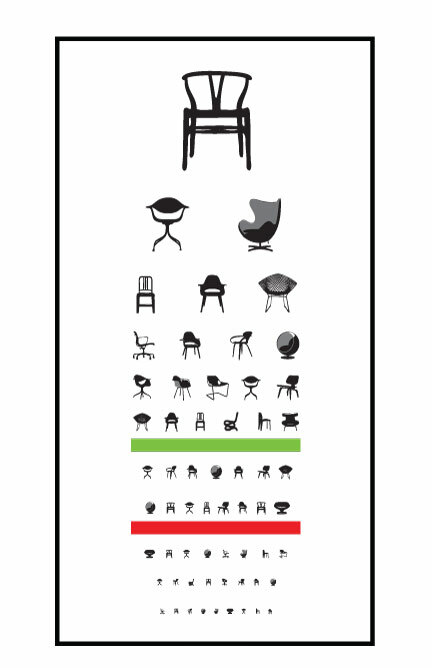 Modern childrens’ furniture isn’t cheap. You have to appreciate that you are paying for the design to justify buying it. I’m a big advocate of buying licensed design products, I don’t buy knockoffs, its sorta a professional courtesy. That doesn’t mean that I think there aren’t great designs out there without a big name designer name attached to it. Target and Ikea are excellent companies cranking out modern and on trend products. Hudson’s toy box is from Ikea and his table is from Target and they all look perfect together. We also pick up more expensive items one at a time. 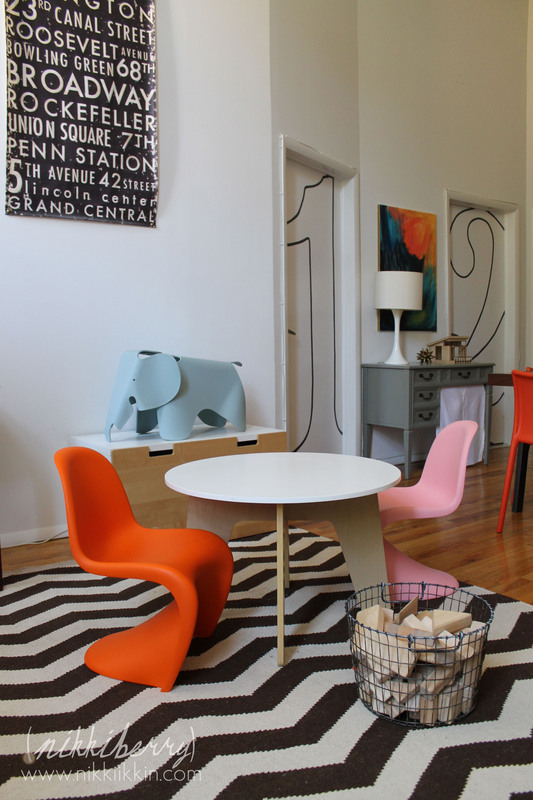 Obviously the pink Panton Junior chair is Macy’s, so we’ve had it for a few years. Hudson got the orange one for christmas and the elephant for his birthday. My kidos love building blocks, this natural wood set from Melissa and Doug, sits out in a wire basket (from Moon River Chattel in Williamsburg, Brooklyn) ready to be made into an architecural masterpiece on a whim. So there are “toy box people” and there are “cubby box people”. I was once a “cubby box mom”, all of Macy’s toys were housed in cute little pink wooden boxes that sat on a shelving unit. I would stress over the collections being separated properly and spend way to much time organizing it all. I got over that and LOVE throwing all of Hudson’s toys in the toy box now. But it doesn’t mean that its completely an unorganized mess. The majority of the childrens’ bedroom closet is shelving designated for board games, playsets and a few cubbies. And within the toy box, I came up with a solution to keep collections like cars, puzzle pieces, block sets & Schleich animals grouped for easy play. 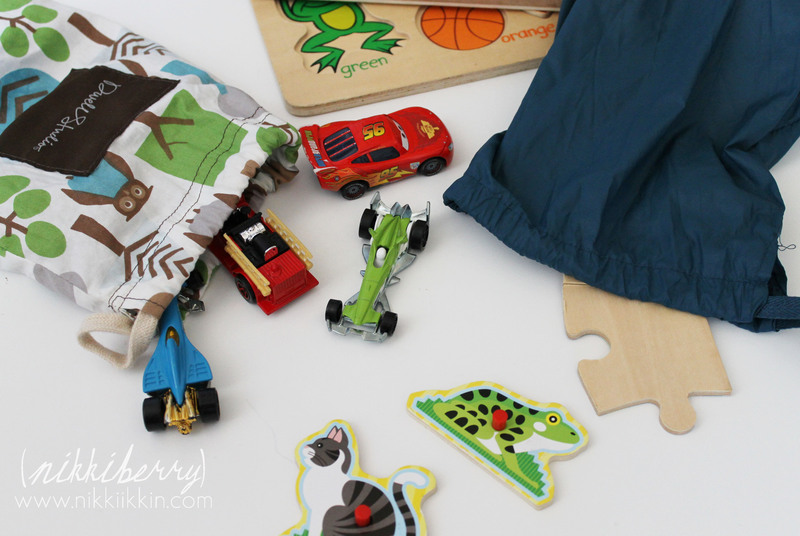 I reuse the cloth pull string bags that sheets and other home items are packaged in for a few of those popular toys…..and then I toss them in the toy box, done! Just shy of 10 years ago there was a major shift in my personal design style. After beginning design school and absorbing knowledge of design theory like a sponge, I had a gravitational pull toward modern design, especially design that spoke of a child’s delight. My design school projects always leaned toward fanciful and whimsy, my biggest dream was to design interiors for Disney. 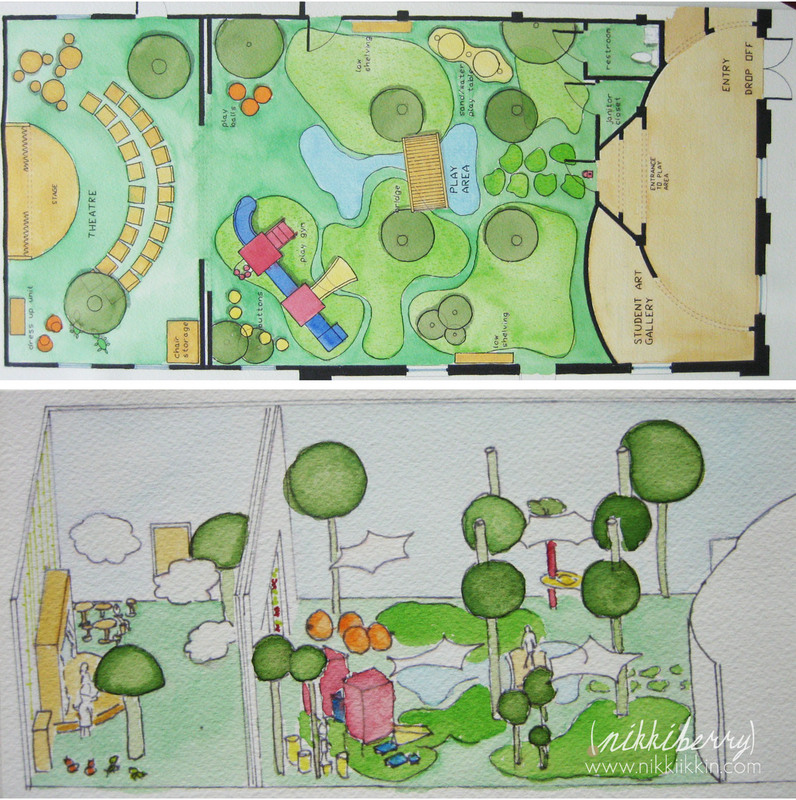 As I developed my senior thesis on symbolism and a child’s built environment I was inspired by Post Modernism, Maria Montessori and the grand idea that arose to create Kindergarden for children. I would have benefited significantly to have seen the MOMA’s latest exhibition: Century of the Child, as scraping together resources for my thesis research was tough. But my intelllectual design voice was understood and my senior project that bloomed from it was a gorgeous, modern Preschool of Art. It was 2005 and the boom of modern children’s product had not yet taken off. 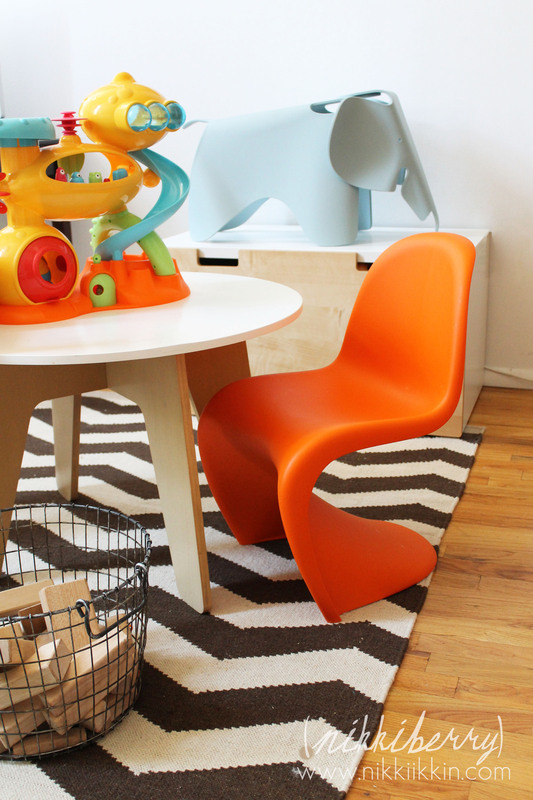 But with sources like Design Within Reach’s children’s store JAX, The MOMA store, Kido, Modernseed and Vitra my modern preschool was well furnished and flowed with symbolic references that would appeal to the child in all of us. Little did the jury panel know, I was really just nesting for my next child. My daughter Macy, now 10 years old, is an old soul. Her style has always been more traditional. She might have been a Victorian they way she likes to collect tchotchkes. 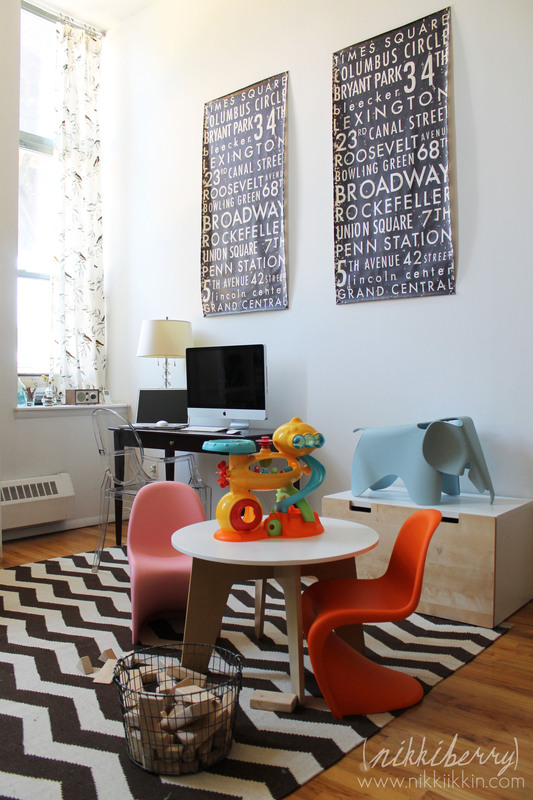 So when my design style changed to modern I used the birth of my second child Hudson, now 2.5, as a reason to buy all the reissued mid-century childrens’ furniture and toys that I really wanted for myself. 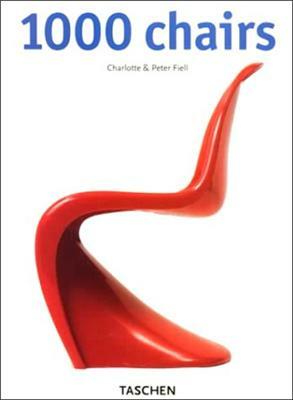 Giraud, Eames, Panton, Nelson and new comers Stark, Ouef, & Dwell Studio are high on my radar for Modern children’s design. All of their products work in harmony in a home like mine where I collect mid century and modern furniture and color is always welcome. Where form is the priority and the history behind a piece always the price tag. 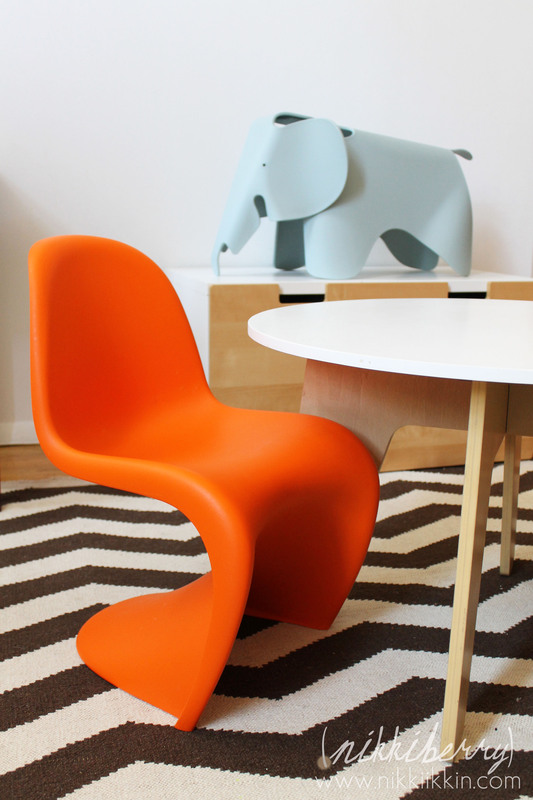 Items like the Panton Jr chairs and Eames Elephant will never be packed up and stored away when my children are older. They are pieces of art to me. I’d like to share how my toddler design collection is coming along. 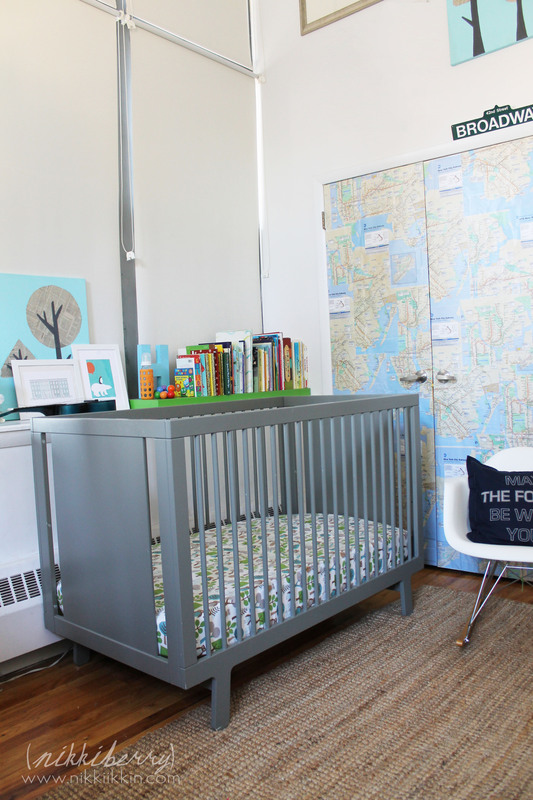 I have already shared Hudson’s Nursery HERE. Its a big hit on Pinterest and one of my most popular posts. He and Macy share a room in our Brooklyn apartment, these pictures are only of his spaces. Hudson’s side of the bedroom is in transition right now, its sort of an in-between phase for him. 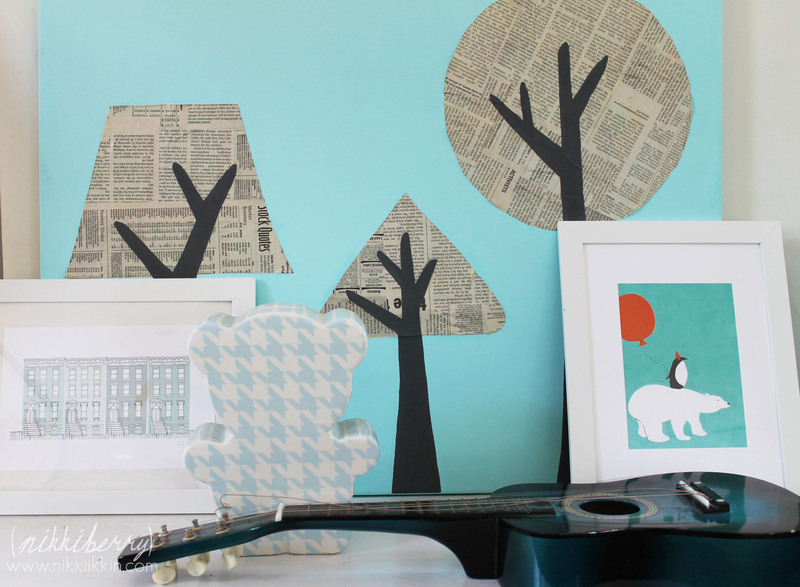 While he’s done with a “nursery look”, the main components of his room aren’t ready to be replaced yet. His Ouef Sparrow crib will soon convert to a toddler bed and he will continue with grey, green and aqua colors but I have changed out some smaller details to update his Nursery into Toddler room. Later on I have I have ideas for a navy and orange room with bunk beds for his young boy bedroom. 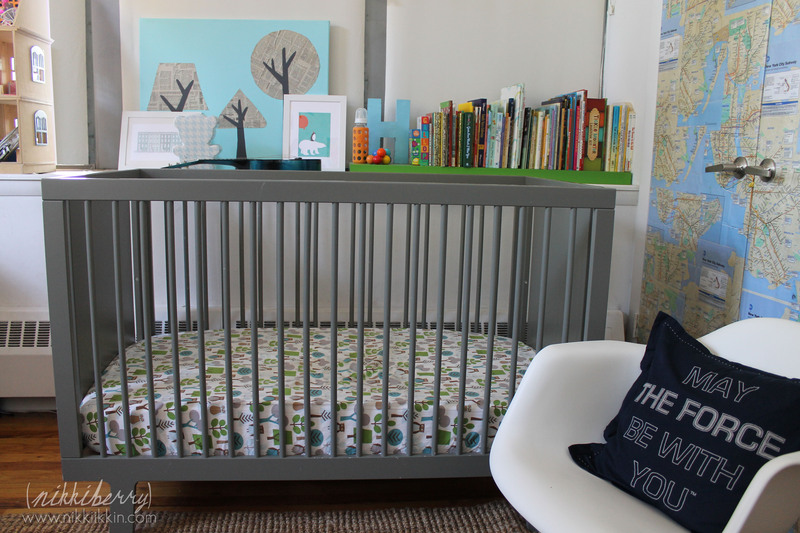 Hudson’s Oliver the Owl nursery was inspired by the Dwell Studio Owl bedding. So now that his bumper and matching quilt are phased out I could work in the sheeting from the Dwell Studio collection. 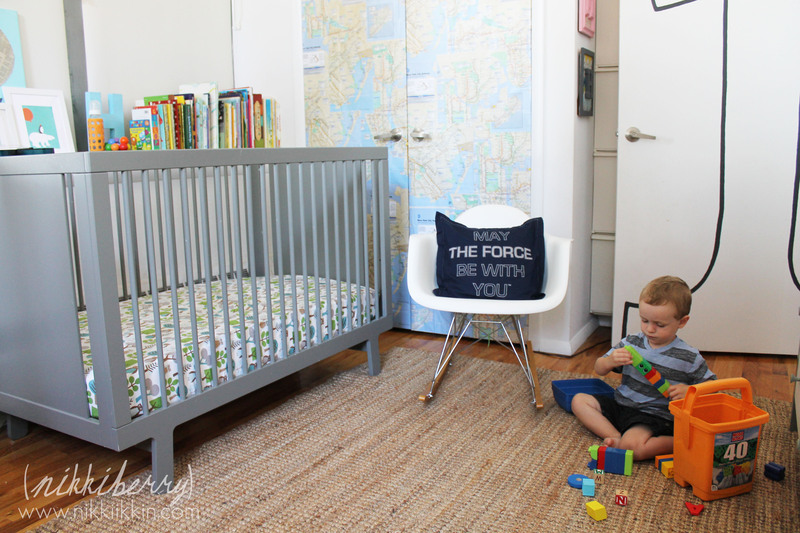 We’ve also begun picking up softgoods, like the navy Star Wars pillow by Pottery Barn Kids, that we know will transition to his young boy bedroom. 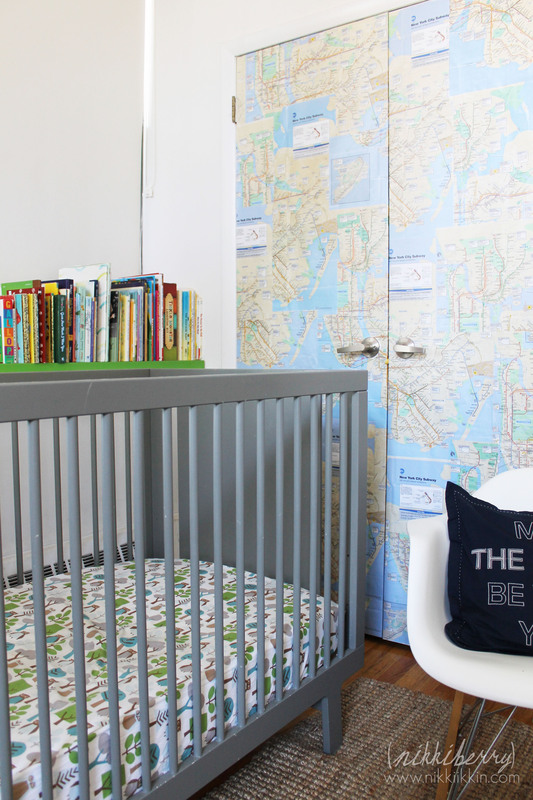 We adore maps, especially the NYC MTA maps, making them art for the room was an easy addition. 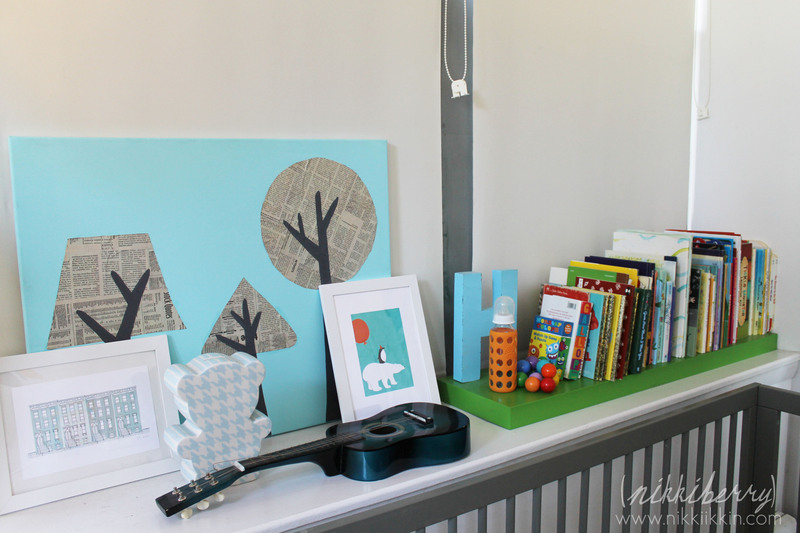 I just completed this awesome DIY wallcovering on the closet doors in the childrens’ room. Look for a post on that soon. Since I added plenty of map graphics in the room we replaced the framed vintage subway map with a circus letterpress print we pick up on a trip home to Nashville from the legendary Hatch Show Print. We love books! We started collection our favorite childhood classics even before we had children. The wide window sills in the bedroom make for an easy book shelf and I used an Ikea Lack wall shelf that we no longer used as a color pop and platform to display the books. The canvas art is my creation along with the Arctic Friends painting. The Blue Brooklyn Brownstones illustration is from Claudia Pearson. Im not done yet! 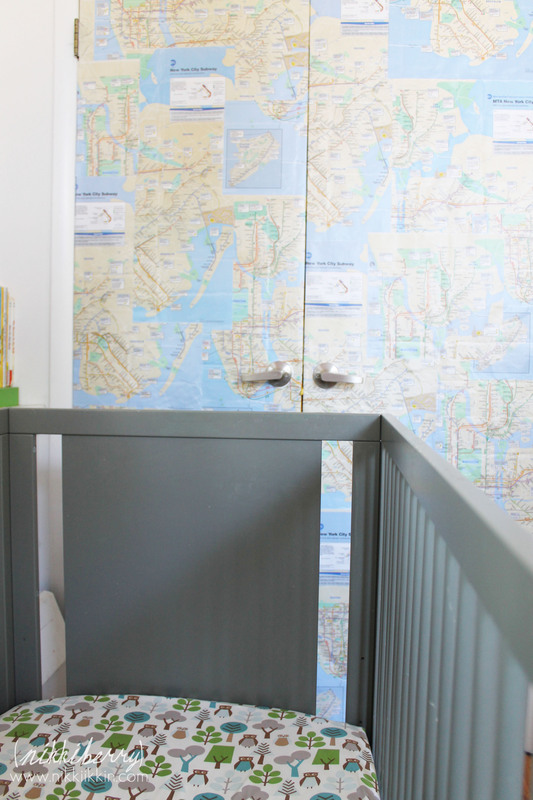 Check back in later for the second part of Hudson’s toddler spaces: the play area.